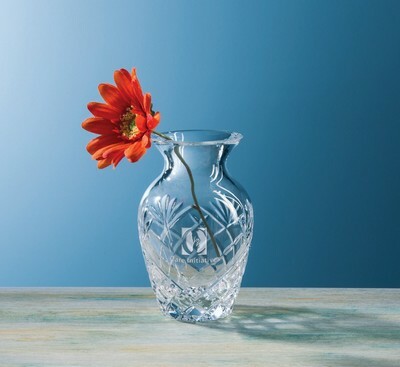 Award excellent performance with the Customizable Camille Bud Etched Crystal Vase, imprinted with your personalized logo in one location. A beautiful gift for your potential customers, Camille Bud Vase is an affordable, customizable glassware item from Sterling Cut Glass. Designed with perfection, this vase features attractive geometrical as well as free-hand accents on the surface to make it a wonderful decoration piece for home or office. Bud shaped vase is hand-cut and polished using 24% full lead crystal glass and is quite durable. Whether or not complimented by flowers, the vase adds charm to any desk, dresser or table. With an etching space available on its front, the vase can be customized to your brand by engraving corporate logo and marketing message on it. Use it as promotional giveaway and attract your customers towards your brand. Click on the location(s) where you want your deep etched logo to appear.